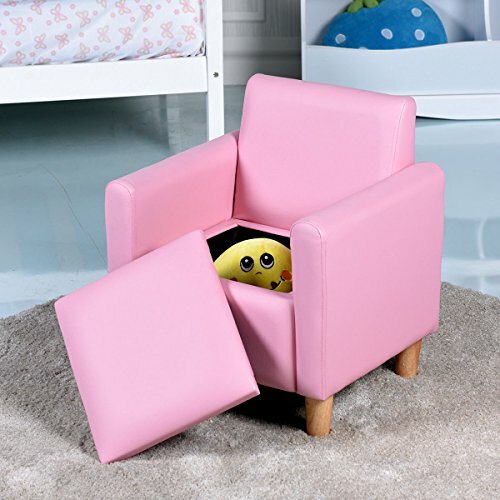 Costzon child sofa is a fun and multifunctional addition to your kids' rooms. It has a strong wood frame for stability, and high density sponge on the seat and arms for extra comfort. Durable and lightweight construction makes this sofa the perfect fit for your little one. Your kids can sit on to watch TV or read books in complete comfort. The bottom of the sofa can be stored toys and books inside. Our sofa is great for entertainment and leisure. It will be your optimal choice. Child Sized Sofa- Purchase ideal furniture for your child! Kids will love to occupy their own sized furniture and enjoy the comfort that adults experience with a sofa that is made just for them! Add a comfort able furniture to any room to create a special place for reading, watching TV or just relaxing. Storage Box Underneath - Toys/books will be accessible with this sweet design. Kids can take out their toys/books underneath and have a seat and play/read. While the handled equipped on the seat part makes the storage box easy to open. LIGHT WEIGHT DESIGN - Lightweight design for easy movement. Your baby can move their own furniture to any ideal place without much efforts, which cultivates their manipulative ability. Cylindrical sofa feet is equipped for better stability. EASY TO KEEP CLEAN - It is not only comfortable, but easy to clean with PU Leather surface. In case your baby spill out juice or snacks, wipe clean with a damp cloth easily and quickly. Ideal Gift - Two colors are available. This adorable sofa is a PERFECT present to your girls. It will be a great addition to their play room, bedroom, living room, day care, sleepovers at grandma and grandpa's, vacations, or nap time. It offers your child a wonderful seat, which can relieve neck pressure and stretch shoulder muscle. Perfect size for your growing toddler.